The latest challenge over at Mrs A's is 'Butterflies + M is for Margins, with the additional option of M is for the colour Mint'. And for once an idea for a card popped straight into my head - there's still almost a week to run so why not have a go? - the pad also includes sentiments and I chose a round one - love the words! 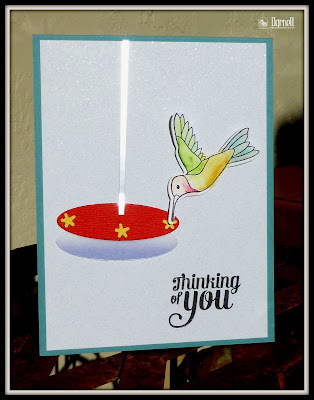 A quick and easy card - love the paper pad I used. Interestingly it's six and a half inches by six and a half inches in size rather than the usual six by six. A lifesaver was my latest toy, the Misti stamp positioner - which I'd dithered over for absolutely ages. Bought it from Dies to Die for last week and was really lucky as Tracey had just had a new shipment, the next shipment isn't due until May. Sure, it's going to be great for batch baking cards as I tend to do a fair bit of that - but, the real bonus I think is being able to re-ink and stamp so precisely over a poorly stamped image. Love it! I think the secret of working with this die is to use the adhesive sheet as I did and also to try to keep the patchwork pieces together within the die cut shapes to be sure to pick the right ones for the framework you already cut - some of the pieces do vary! The photo (OCD strikes again) has slightly picked up the white inner core of the patchwork frame, making it look a bit as if there are gaps - in fact the pieces fit really snuggly, sigh :( One to remember here in future, use card stock without a white core! I got the design idea from this blog, by Barbara Anders. She's on the MFT DT and has some wonderful cards to see - looks as if the card I CASE'd has had its image deleted from her blog though. Thankfully it was still on the MFT site and it's still worth hopping over to see her work! Have to admit, I'm quite tickled with the result and it's a great way to use up quite bold papers. I chose to back my plain white 'Thanks' using the coloured card stock immediately behind the word. Other options would be to just leave the word as it is (it's quite sturdy enough) and perhaps colour it with Pro markers if you don't intend doing anything extra inside the card to make it show up more, use coloured card of course, add a contrasting strip to the inside (back half) of the card lined up with the word or perhaps back the word with acetate - the list goes on :) It's a really fun die! Not only did Chris bring this card to the Playground, she also sent it to me as a thank you for her recent prize win (and managed to use a die, an image and also a sheet of the paper from the win). It's absolutely gorgeous and really beautifully made - I love it! And the branches and , flowers and leaves are all snippets too. Hasn't he grown in just six weeks? And what a darling little chap he is! This is such a clever design, brought to show by Krisha. I love how the stamped, coloured then fussy cut tulips sit within the white frame on the beautifully toning background paper snippet, which then extends to form the outer frame. Brilliant! 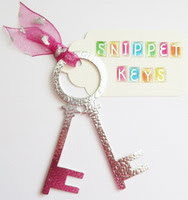 Alison had been playing with snippets and circle dies - this is one of three great ideas over at her blog - go HERE to find out more. I love this idea and will be having a play as soon as possible. The beauty of these designs is that you can make them for male or female recipients, just by changing the papers you use. Strong and bold for a chap - pretty and soft for a lady :) That's the traditional theory anyhow - these days it's often the other way round in real life! Sonia always brings really lovely work to share with us, and this is no exception is it?! Made for her DT spot on Mrs A's current Butterfly Challenge, I think it's absolutely lovely! 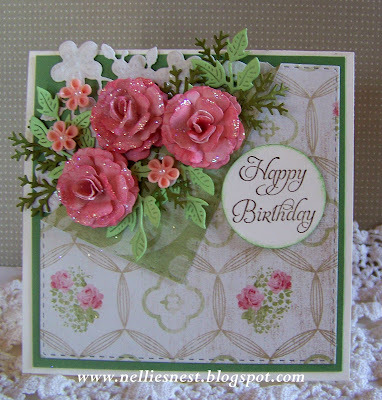 Francesca brought this fabulous Magnolia card to share - so much beautiful detail! I love the sheer joy that truly does spill out of these journal pages - fabulous colours! Brought to us by Rachel. Tanvi made three gorgeous letter racks and this is the one she entered into the Playground this week, do go and take a closer look at the side views on her blog HERE. Really great! I love this 'vintage' Christmas card, brought to share with us by Marianne. It appeals to my 'neat freak' side - yet still has a vintage look! And finally, Margaret M hopped into the Playground with this really pretty snippets card to share with us -and a clever way to use the ribbon and bow too! Hope to see you again really soon! Darnell's first port of call (that's appropriate!) is Southampton (Grand Harbour Hotel) and there is a get together (aka soirée - snigger) planned for Tuesday 19th July. I'll be there, aided and abetted by Parsnip (if the choklit is all cleaned up from his fur), along with a few other notorious Playmates/bloggers. After that, Darnell plans to spend time in various parts of the UK (Salisbury, Somerset, Bristol, Manchester area (Knutsford I think), then the Swindon Retreat itself with lovely folk such as the Less is More gals, Kathy K and others - followed by a short time in London (Pimlico area) before she heads back home on Wednesday 3rd August. If you want more details I think it's best for you to contact Darnell directly (her email link is in her blog profile). If you get stuck (I can never get those email links to work on my Linux operating system!) then feel free to contact me and I'll forward any emails onto Darnell. Even if you're unsure about arriving on your own - don't be! You're a lovely little band of crafters and will soon find that everyone will be welcomed with open arms. Exciting (and probably slightly scatty) times ahead! Ha! It was actually around last Easter when Diane won, so this is certainly due! 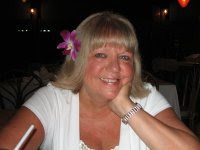 I still have your address from then Diane and will post the stamps off to you this coming week - well done. 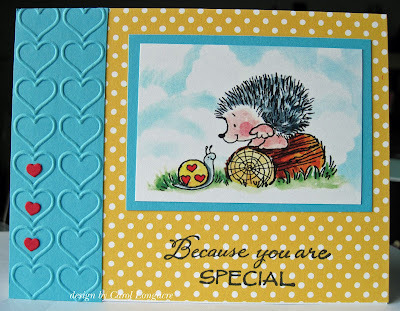 Of course, it's a die the same as the one I used for my snippets card today - a Frantic Stamper 'Thanks Card Band' die. Not a massive prize but hopefully it's a little bit unusual and something you'd like to win. 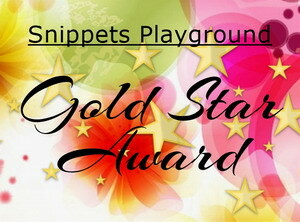 The Snippets Challenge will run for one week and the Playground gates will close at 11am UK time on Saturday 2nd April. The gates will open again at midnight UK time on the same day. A maximum of ONE entry and please say in a comment if you wish to play and be a possible winner of the prize.Please also link back to the Playground in your blog post to be eligible for the draw. Job done, in double quick time! So glad I opened that Really Useful Box to see what was lurking within. 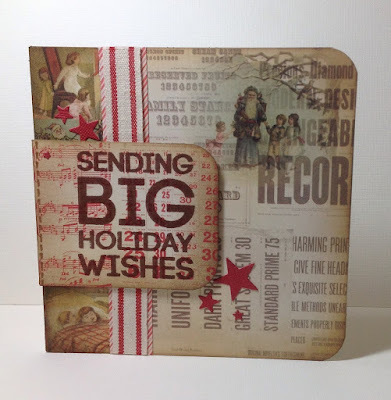 This card is also for Craftyhazelnut's Christmas Challenge #273 (Cute or Anything Goes this week) as well as Craftyhazelnut's Christmas Challenge Extra for March 2016 (always Anything Goes). That's 40 cards in the box for Christmas - but I'm lagging a bit behind as my target was 12 per month beginning in December, eight more to make before the end of March. It's all down to time lost at the desk when I couldn't sit for very long - and to be honest, a bit of apathy on my part :( I can see some 'batch baking' ahead! Edit: Thanks to Andrea for pointing this out to me - this card fits in with the current Memory Box # 10 challenge which is blossoms and/or bunnies. Where have I been all this time, what a great challenge - especially if you adore Memory Box products as much as I do! We have a lovely young neighbour who usually calls by with a small Easter egg for us. So there are three of these little 'eggs on thrones' waiting for Hemma - one for her, and one each for Gerry and Nina, her Mum and Dad. Ha! And there's two left over in the box of five to be scoffed too :) Well I never! And slap my wrist, due to going out to play in the sunshine I neglected the Playground today - will catch up ASAP! The current challenge over at Less is More has the theme of 'What's outside your window' this current week. Either real life or in your imagination. I went for real life as we get hours of pleasure from watching the antics of a variety of birds in the garden, not least when they all queue up for a bath. The Stampin' Up stamp I used for my card sums it up really - they flick the water everywhere (some of the cleverer birds just sit underneath the bird bath and take a shower) and it's a constant job to keep topping up the water level for them. Plus, over the past two weeks, we've spotted that our resident male robin has been joined by a 'wifelet' - so Spring must be in the air if he's let her onto his territory! I know a good few of you were already visiting the blog/Playground back then - but for those who weren't and might want to see the original post about the 'ice spike' which appeared overnight - it's HERE. And it also appears on Wikipedia - fame for the Playground! OK, who stole this past week then? I can't believe how fast it flew by! The weather has been up and down - Parsnip is switching between a body warmer and his sunshades! - stamped the sentiment using Memento 'Tuxedo Black' ink and a stamp from the Stampendous 'Happy Messages' set - directly onto the card front - ha, before doing anything else! I love both of these stamps, they're quite fresh and funky looking and there's also scope to paper piece. 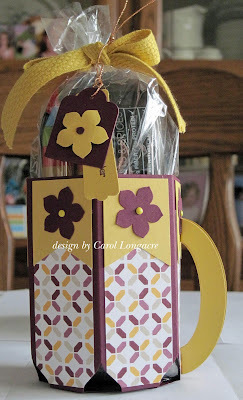 How clever is this mug, holding Easter treats, made by Carol L. A really great idea and the traditional Easter colours are fabulous too. Such a pretty card, made by Heather. I love the design but what really adds even more to the card are those layers on the little lady's dress - they're vellum which has been inked in different colours and the effect is just fabulous! And here's a totally amazing card, made by Janis of Her Peaceful Garden. I love the finished card in any case but (although some of you have already hopped over to comment) - I wonder if you can guess how those beautiful background roses were stamped? Think lettuce and you'd be getting warmer. Go and see - you won't regret it! And last, but by no means least, how about this glorious card - made by Diane H? I just adore it and how clever to have all those beautiful flowers peeping out of the turned down corner. Amazing - and a delight to look at. We had no new Playmates this week, although with 57 entries the Playground was still busy of course. Well done Meg, your last win was August 2015 so it's good to see your name first out of the hat this week. I still have your address and will post the prize off to you this week. I'm a bit conscious that those of you who opt for just one part of a prize might feel that your name never seems to come up as a winner. Please rest assured that I'm very happy to split prizes even though it would cost extra postage - so don't feel it lessens your chances! It's just the luck of the draw, everyone has an equal chance now and it's far better that you don't win something you don't really want. So please still feel free to opt for just part of a prize, Mr Random will pick you sooner or later I'm sure. 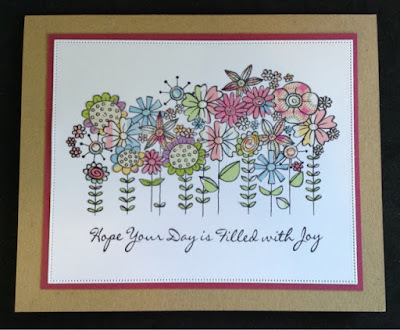 Linked to today's snippets cards - it's two of the same Woodware stamps that I used on my cards today ('Boxed Daisies Trio' and Cone Flower'). The Snippets Challenge will run for one week and the Playground gates will close at 11am UK time on Saturday 26th March. The gates will open again at midnight UK time on the same day. A maximum of ONE entry and please say in a comment if you wish to play and be a possible winner of the prize. If you only want to play for one or other of the stamps then just say so in a comment - if your number comes up then I'll do a further draw for the remaining part(s) of the prize. But, both stamps are up as one complete prize if you so wish of course. Please also link back to the Playground in your blog post to be eligible for the draw. As I said, the die was free with 'Papercraft Essentials' magazine not so long ago and, unlike the other free Christmas die I recently had such a disaster with, it cuts beautifully, releases the die cut without a fight and is really robust. It's one of my favourite dies and up there with the Penny Black 'Hooray' set in terms of quality, which is praise indeed! Called it a day :) Now I just need some new babies on the scene! 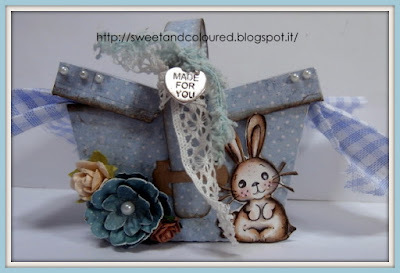 It's time for a new challenge over at Cuttlebug Mania - and this time it's 'Happy Easter' (make an Easter project). I opted to make a pretty simple card card but there are lots of lovely things you can make to contain Easter eggs or chocolates :) The choice is yours! Our sponsor this fortnight is 'A Day for Daisies' - more details of the prize are over on the challenge. I didn't have a true egg shaped die but thought this pretty oval die would look fine. It reminded me of the most wonderful Easter egg I was ever given as a child - made of sparkly white sugar paste and so intricately iced. It was bought for me by a lovely couple who had no children of their own and maybe liked to spoil other people's kiddies. It had a tiny little scene from Cinderella inside which you could peek at through an oval 'window' and it was absolutely exquisite. I never sampled it and kept it for ages. I think it eventually went yellowed and sticky with age! 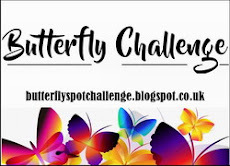 I hope you join in with the challenge, remember it runs for a fortnight so plenty of time to play! Yay, and another week just whizzed past! Really mixed weather here in the Playground too, everything from high winds, rain, hailstones, snow (just a few flakes) and then misty mornings followed by a good bit of sunshine. I love this card, made by Chris. Such a wonderful background topped with the trellis - and those butterflies are just fabulous! Love, love this card - made by Maura. Wonderful background here too topped with the lovely blossom and that sweet bird, it just oozes Springtime to me. This fabulous card was brought to show by Brenda - just prior to a little trip to the theatre for a date with a surgeon :( Hope you're recovering well Brenda! 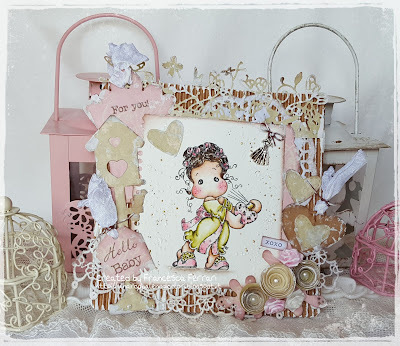 LOVE the bronze, butterfly and buttons on this beautifully made card and of course one of Brenda's trademark bows - everything about it is just so perfect. 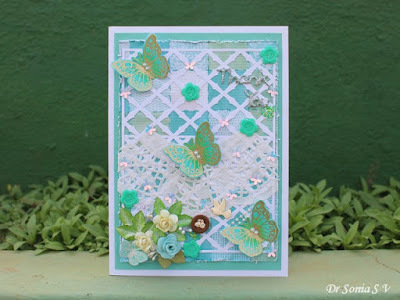 The current theme over at Mrs A's Butterfly Challenge is Butterflies + B is for Buttons and/or Bronze .............. hence Brenda's gorgeous card. Why not join in, I'm still thinking hard here but do want to play and the challenge is open for a further 10 days or so. As you know, I'm trying to keep time spent at the desk down a bit so will be trying to stick with three or so picks - this week it's actually five picks and this final one just rocked me on my heels! 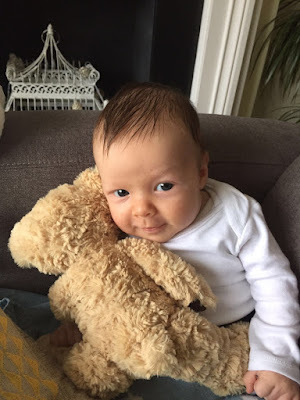 A few of you have already been over to Cara's blog to comment and it would be just fabulous if more of you went to have a peek. Of course you can then enlarge the image for a closer look as well - and then you'll see that every single element in this row of flowers has been individually paper pieced! 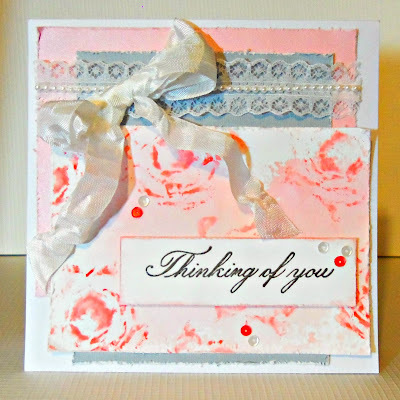 A huge double-wow from me for patience Cara - it's gorgeous! We had no new Playmates this week, although with 63 entries the Playground was still busy of course. I heard more chinking of glasses so goodness knows what Sarn's celebrating now! I've checked back in my little black book and also this blog Chris, and am sure this is your first prize win in the Playground - yay! Can you please drop me an email with your postal address and I'll send your prize off as soon as possible this coming week. My email address is on the right hand sidebar BTW. Now here's this coming week's prize(s) - a two-parter. Linked to today's snippets card - it's a House Mouse 'Jelly Bean Nap' stamp, just like I used today. Plus, a lovely set of dies kindly donated by Barb, called 'Frames and Tags - Refined Rectangular Frame' - Sizes: 102mm x 64mm (Frame) & 59mm x 23mm (Tag) - made by Creative Expressions and designed by Sue Wilson. Thanks so much Barb - someone is going to love these really pretty dies! The Snippets Challenge will run for one week and the Playground gates will close at 11am UK time on Saturday 19th March. The gates will open again at midnight UK time on the same day. A maximum of ONE entry (just to remind you!) and please say in a comment if you wish to play and be a possible winner of the prize. If you only want to play for either the House Mouse stamp or the really great die set then just say so in a comment - if your number comes up then I'll do a further draw for the remaining part(s) of the prize. But, both items are up as one complete prize if you so wish of course. Please also link back to the Playground in your blog post to be eligible for the draw.